The third part of my visit to Billings was at Carter’s Brewing Company. The beer selections were outstanding. What I found even more interesting was the young woman who was pulling beers. Lift your thoughts to a little higher level guys….she was one of the most knowledgeable beer servers that I have ever encountered. I sat patiently at the bar waiting my turn to order as she educated a handful of college age girls on the hops, the malt and variations that differentiate the beer offerings. 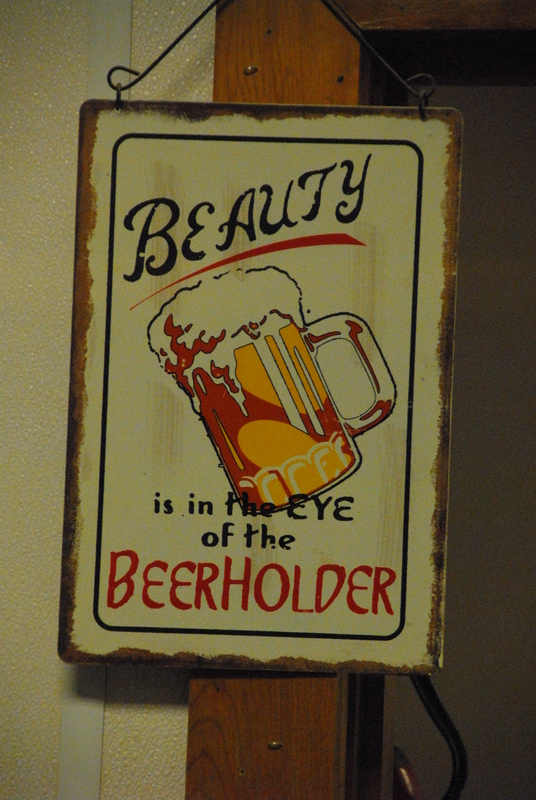 She did it in a way that engages you in dialog….not just being told about the beer. The offerings were displayed on a big colorful chalkboard behind the bar…….the standards and those on rotation. Michael Ulrich, owner and head brewer is a creative and energetic brewer. I never really got to sit and really enjoy a pint here. When Christie the barmaid worked her way through the education and sampling process for the many offerings I was truly confused….but that was OK with her. She soon found out that I brew my own and that I am an IPA fan and that was all she needed….she put a splash of this one and that one in small glasses and based on my responses she would pull another one for me. I was overwhelmed with both the variety and the quality of the beers. Now, there were a few that were not my cup of tea….but that does not mean that they weren’t good beers, just different. The taproom per Montana law shuts down at 8:00PM – you still have till 9:00 PM to vacate the bar. I spent a big chunk of time picking her brain on the various beers, hops and flavors….I walked out very impressed with Carter’s, Angry Hanks, Montana Brewing Company and the energy these folks pour into their craft. I must go back with no work planned….visit the breweries, try the fishing, maybe even the rafting….Chrisites and her husband raft using oar boats and see the countryside. Cody and Cris did show up and they bought me a pint at the bar next door after Carter’s closed up, it was good and it was cold but I didn’t write down the choice. I have been using the notes feature on my iPhone to keep my tastings in order but I got lost in conversation and did not want to be rude writing rather than listening. I promise to do better on my next visit. 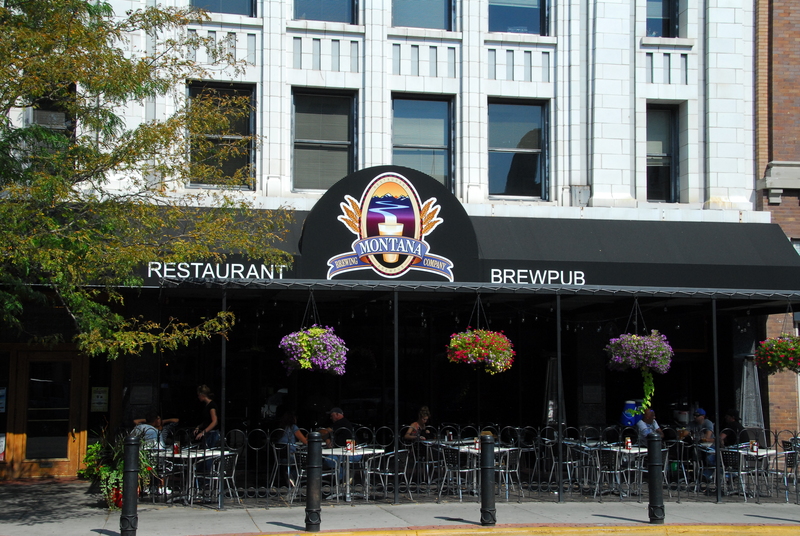 I am home from my trip to Billings and the research did not do the brewing community justice….Billings, Montana Knows Beer! Wow, I am impressed! Part 1 – on the day I arrived I checked into the Crown Plaza Hotel…well located and walking distance to lots of food and beer. The other plus, they have a shuttle to and from the airport. Enough of that. After checking in it was time for food and beer. I wandered down to the Montana Brewing Company Restaurant and Brew Pub. They had 8 of their offerings on tap. I wanted to maintain my equilibrium so I ordered the sampler, 8, four once servings……that seemed to be manageable, 32 ounces of beer, really just two pints over a meal! What caught my eye on the menu was the Gorgonzola Chicken Sandwich and of course the 8 beer sampler. So, how did it go? Well, I’ll tell you how it went. The sampler arrived first. – Yee Haw Cowboy = served with a placemat describing each sample. I drank them in the recommended order. Yes dear, I do follow orders – sometimes! The MBC Golden Ale was up first. It was a nice crisp tasting beer, one that you could probably drink all day long in the summer. A very refreshing beer. The next in the sequence was their Happy Hour Hero – an English ale. They described it as a session ale and I would agree. It was also very easy to drink – a nice golden honey color and nice, nice taste. Two for Two on the Bishop-Beer-O-Meter! The MBC Wheat was also a winner – I am beginning to see a pattern here! Comes with a lemon slice that compliments the mild citrus taste and aroma. I think my bride would enjoy this ale – nice citrus notes but they are in the background and no coriander/bitter orange that the Belgian Wit beers seem to carry. Low on the IBU scale but that is not a bad thing. I may want to try to clone this one for my bride! Next in the recommended sequence was the Pomegranate Wheat. I was expecting something that might be too sweet and fruity but I was pleased with the offering. Yes there was the pomegranate flavor but it was really more of an accent flavor and not dominant. I am a lover of pomegranates….goes back to my childhood – my aunt Josie would make pomegranate jelly every fall and I loved it. My uncle worked for the water company in Taft and the Western Waterworks equipment yards were ringed with pomegranate bushes/trees. I loved to peel and eat the pomegranates…lots of work, small rewards but the flavor is awesome. Leaves me longing for some buttered toast and my Aunt’s jelly. My waitress’ favorite MBC beer was up next. The MBC Amber Ale – first sip and I said to myself, “Oh my!” This was a good beer, nice feel in the mouth, nice aroma and enough malt flavor without being overwhelming. She knows her beer. The MBC Pale Ale was next up and this was my favorite. The cliché popped into head – “Now that’s what I’m talking about!” it was that good – in my opinion of course! Nice hops flavor, pleasant aroma, copper-colored and slightly cloudy…..very nice beer. The British Invasion IPA by MBC followed the Pale Ale. IBU rating of 50 but honestly I was a little disappointed – I was expecting something a little more bold in the hops aspect of the beer. Now, don’t get me wrong, this is a good beer but not what I expected as an IPA. Last on the sampler list was the MBC Custer’s Last Stout – and oatmeal stout. Complex flavors – a bit of a bitter coffee flavor and a bit of a caramel aroma. A good stout but not quite and bold as I like. Still, very drinkable and a good beer to end an evening with on a cold Montana winter night….not sure I want to be out in the Montana winter cold at night, but this stout may stave off the chills if I find myself out! My choice….I had a couple of bites of Gorgonzola chicken left so, I ordered a pint of the MBC pale. I gues that makes 3 pints of beer – still a reasonable number and not overwhelming. I still found time that afternoodn to spend nearly an hour in the hotel gym….not napping, I really worked out- trust me! 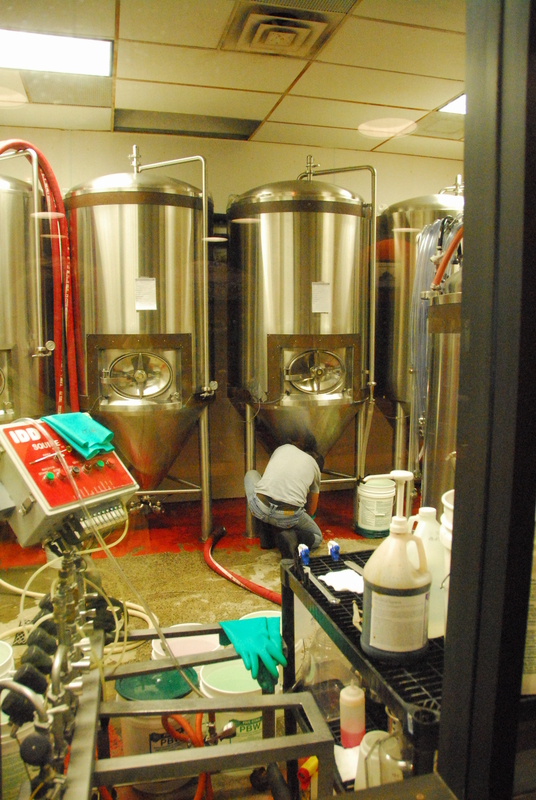 I spent a little time watching the action in the brewing room behind the glass. Clean and well laid out. Montana – who knew? The state is very well represented in the craft brewing category – Part 1 B – I did try a Big Sky IPA the next evening at dinner with my client….Missoula, Montana beer from the Big Sky Brewery – it was good enough that I had two! Check out the Montana listings in the link below. I have been asked to deliver one of my training sessions in Billings, Montana for a small energy producer. I have been doing a little work for them over the past few months. Sessions in Midland, TX, Houston, TX, Laredo, TX and Williston North Dakota. Midland – beer offerings are ordinary and lack variety for craft beers lovers. Houston – Making its mark with some excellent local choices and establishments. I am working on trying them all – Karbach, St Arnolds and Southern Star are top notch. No Label Brewing in Katy is on my bucket list, as is Bayou Brewing…. Laredo…sorry my research is coming up empty. Billings Montana – Jackpot !!!!!! 8 craft breweries in the city limits and 10 in the greater Billings area…. Three days is only going to whet the appetite – I will provide a report out sometime around the 7th or 8th of September….maybe some updates via iPhone posts…. I do have to real work to do – kinda….I have a trout fishing float trip scheduled for the 5th and the class is on the 6th. I will behave appropriately! There are 4 beer brewers within walking distance of my hotel and Angry Hanks looks like a short cab ride away…. Most will offer tasters…those little 5 oz glasses……an easier way to taste a broad suite of beers….. it used to be that 5 pints wasn’t much effort but I would like not be swayed by that 5th pint….The truth and only the unbiased/unhazed truth. 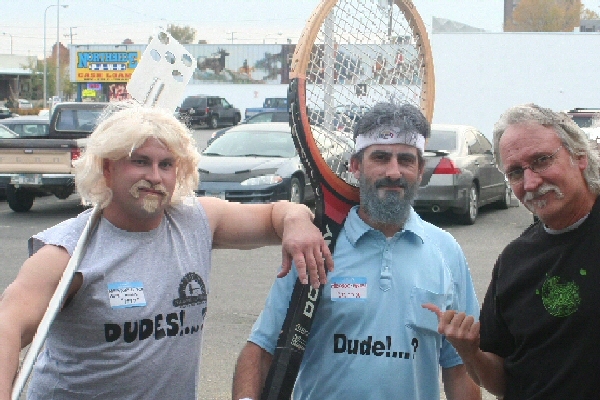 A little research brought up this photo…..looks like people I can relate to !!!! Yellowstone Valley Brewing Co. Staff. I apologize if I am using your photo without permission…..you were just such a handsome bunch that I could not resist. Just a thought – old stories, mountain bikes, blood, beer and essentially flat trails……a birdie dropped a little something in my inbox today and the stories, to the best of my recollection, may find a forum here……beer and blood in the early mornings…could be fun. Thanks Pat. Leave a comment Posted in Ale, Beer, Travel Tagged Bayou Brewing, Billings MT, Karbach Brwery, No Label Brewery, Southern Star Brewery, St Arnolds Brewery, Yellowstone Valley Brewing Co.